ART is a soft tissue management system designed to rid injured areas of scar tissue. Our doctors employ ART in musculoskeletal disorders to remedy injuries such as carpal tunnel syndrome, shin splints, rotator cuff injuries, sciatica, plantar fasciitis, knee problems, tennis elbow, headaches, and back pain which are just a few of the many conditions that can be resolved quickly and permanently with ART. These conditions all have one important thing in common: they are often a result of overused muscles. Whether you are an athlete, laborer, stay at home mom, or secretary, we are all prone to over-using muscles at our jobs and in our daily lives. Overuse Syndrome is a common ailment in our society. With work duties, athletic events, and daily lives etc putting repetitive stresses on the same structures we often develop this syndrome. These stresses may not be painful, but as the body compensates for long term use of an individual muscle or group of muscles it begins the process of self-preservation and the soft tissue adapts and changes over time. • If a nerve is entrapped it can cause numbness and tingling in the affected area. 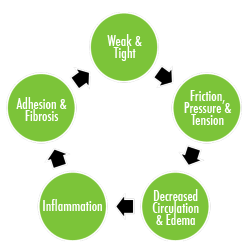 Our body uses scar tissue extensively in the same way that tar patch repairs are added to fix small cracks in the road. When muscles, or other tissues, are overstressed or injured, our bodies use scar tissue as a patch repair. This is a natural part of the healing process. However, if the source of the injury is not corrected the tissue will accumulate too much scar tissue, which then becomes a problem. This is similar to when a road has been given too many patch repairs and is no longer smooth. ART is not a massage, which is useful for decreasing muscle tension. Instead, the intent is to "resurface the road." This technique works out the scar tissue and helps the tissues to heal normally with long-lasting results. It is important to state the pain, numbness, or other symptoms may not resolve if the scar tissue is not broken up as well as the source of the tension discovered. Both of these can be accomplished by a careful exam and knowledgeable ART provider. The Graston Technique®, originally developed by athletes, is changing the way clinicians, including athletic trainers, chiropractors, physical therapists, occupational therapists, and patients view treatment of acute and chronic soft tissue injuries. The instruments comb over and “catch” on fibrotic tissue, which immediately identifies areas of restriction. This enables clinicians to treat soft tissue lesions with the depth, pressure and specificity necessary to affect the condition at the site of the pain, as well as following the kinetic chain to find and treat the cause. Once the tissue dysfunction has been identified, the instruments break up the scar tissue so it can be absorbed by the body. By incorporation stretching, strengthening and ice in the treatment and rehab process, clinicians can rebuild the soft tissue injury into healthy functioning tissue. For more information about Graston Technique please visit www.grastontechnique.com. The McKenzie Method® of Mechanical Diagnosis and Therapy® was founded by Robin McKenzie, a physiotherapist from New Zealand. It is not only a method of treatment, but also a powerful assessment tool. A short history and screen can identify patients who are likely to respond to the principles of the McKenzie method. Therapists utilizing this method aim to classify musculoskeletal pain and educate patients on treatment options based on utilizing a series of specifically prescribed exercises. Often times these exercises include repeated movements or sustained positioning that aim to reduce, centralize, or completely abolish pain. The ultimate goal of McKenzie practitioners is to educate patients to be able to treat themselves without continual supervision from the clinician, allowing for fewer patient visits. Dry Needling is an evidence-based treatment that relaxes tight muscles, controls inflammation, promotes tissue healing and reduces pain perception through the use of acupuncture needles. Postural Restoration Orthotics are made in cooperation with Dr Coffin a podiatrist specializing in biomechanics as it relates to the feet and lower legs. Dr Ideus works closely with Dr Coffin in order to created an orthotic that will be the most beneficial for you. The orthotic therapy will be paired with the other treatments offered in the clinic to give you the best chance of feeling better. Synergy Chiropractic Spine and Joint Center would like to help you make an informed decision about your health. In order to treat the whole patient from the foundation up, and achieve optimal health, we think it is necessary to integrate soft tissue treatment, joint manipulation, rehabilitation and nutrition. The best way to get the nutrients you need is consume whole foods. With the ideal diet, no supplementation would be needed. However, the majority of people do not get enough balanced nutrition, due to nutrient depletion of foods, cost, habits, and convenience. Our goal is to find fun and easy ways to incorporate the nutrition that we need. Synergy has partnered with a company called Standar Process for supplementation needs. We chose them from the plethora of nutrition companies in the market due to the research, development, and overall quality of their products. We are confident that you are getting the very best when choosing Standard Process Supplements. We offer the basic daily needed supplements in our office for your convenience but for more complex issues we use the combination of your health history along with a health condition questionnaire in order to find the correct supplements for you. Visit their website at www.standardprocess.com for more information. The inflammatory process, also called inflammation, is best viewed as the body's response to injury, and the function of inflammation is tissue healing. In short, the inflammatory process is a chemical process, and no matter the source of injury, inflammation is the outcome. From a practical perspective, we are all dealing with the inflammatory process at this moment to varying degrees, and this is because we all experience injury on a daily basis, which is either overt (macro-trauma) due to falls and accidents, or subtle (micro-trauma) due to normal activities of daily living. Some of us heal better than others, and part of this is a genetically determined issue; and it is also a dietary issue. No doubt, all individuals have heard that we can prevent heart disease and cancer by eating more fruits and vegetables, and by eating less fat and sugar-concentrated foods. Why is this? Because fruits and vegetables are anti-inflammatory, while high fat foods (excessive saturated fat, trans fats, and omega-6 fatty acids) and sugar foods cause inflammation, and both heart disease and cancer are pro-inflammatory diseases. With this in mind, we can begin to see that our diet can be a source of injury or chemical trauma. The topics of dietary trauma, macro-trauma and micro-trauma are discussed more below. Most people do not realize that the following conditions are caused or promoted by inflammation: aches and pain, osteoarthritis, rheumatoid arthritis, osteoporosis, acne, aging, syndrome X, diabetes, cancer, heart disease, peripheral vascular disease, stroke, Alzheimer's disease, Parkinson's disease, multiple sclerosis, and more. Health and wellness essentially refer to a state of optimum function -- an optimal state of physical, mental, and social well-being. Optimal function is an ideal that we can pursue through appropriate lifestyle choices, particularly diet, exercise, adequate sleep, healthy mental pursuits, healthy relationships, and a job we like. Please understand that "true health" is not a realizable state -- it should be viewed as goal to achieve throughout one's lifetime. While health and wellness are essentially synonymous, the term "wellness" is typically used to describe the active care performed by the patient for the purpose of promoting health/wellness. Wellness is actually defined as optimal function achieved via exercise and proper nutrition. The deflaming approach to nutrition that includes diet and supplementation represents a method to pursue health/wellness and prevent disease. Acupuncture is one discipline from Traditional Chinese Medicine, and the earliest source of acupuncture theory actually comes from the 2nd century BC. Since then, it has been constantly evolving. Acupuncture involves the insertion of very thin needles through the skin at strategic points. These points may be close to your problem or somewhere else on your body. The needles stimulate the central nervous system, releasing chemicals into the muscles, spinal cord, and brain. The biochemical changes stimulate the body’s natural healing abilities and promote physical and emotional well-being. If you are unsure if you want to use needles, there are options for laser, point stimulator, or acupressure over the points. In the United States, acupuncture has been increasingly embraced by practitioners and patients since New York Times columnist James Reston traveled to China for President Nixon’s 1971 visit. While in China, he suffered from an attack of appendicitis, and his appendix was removed in an emergency procedure. His post-surgical pain was treated successfully with acupuncture. His reporting of this in the NYT helped open the doors in this country to an exploration of Chinese treatments. More recently, athletes and celebrities have been those who are exposing acupuncture to Americans. Battle Field Acupuncture is one of the more popular forms of acupuncture used in the military. Dr. Richard Niemtzow developed the technique in 2001 to provide immediate relief for pain, while allowing service members to continue to participate unimpaired in work and life. Service members who use BFA can still fly aircraft, unlike those who use opiates. This involves small needles inserted into the ear which have a central effect on the nervous system and the cingulate gyrus, an area of the brain that processes pain. There are also many other points in the ear that these smaller needles can be used to stimulate. The basic idea of modern auricular (ear) acupuncture is that every part of the body has a corresponding reflex point in the ear.